If you are going to be cooking a lot of rice or for a lot of people or for a long time to come, I suggest investing in a rice cooker, which will take all the guesswork out of cooking rice. You can also cook rice in a pot on your stove. Just fill the bottom of the pot with approximately one inch of rice, then add another inch of water on top. Boil for approximately 20 minutes or until rice is tender. 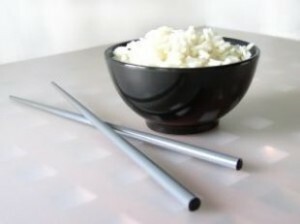 The only problem with rice is, it is bland and most people only know how to prepare rice by boiling it. Here’s a great way to get rid of that bland-rice flavor and add some spice to your dish! - Your Choice of Shrimp, Chicken, Beef, Or Ham. In a Skillet, saute your choice of meat, then add onion, leeks, carrots and Rice. In a separate skillet fry egg, then add to rice mixture. Add Soy sauce & Sesame Oil for taste! Goes great with Beer or Sparkling Wine and for the kids Fruit Punch! When you think about rice, does it bore you? If you answered yes, then you are like most people. Rice is a staple food for most of the world, it’s fast to cook and it’s available everywhere. Rice is the most important grain with regaurd to human nutrition. Other ways in which we can cook the grain are questions, we as masters of our kitchen must ask ourselves. Above is one fun recipe in which you can take plain old rice and make it fun and yummy for you and your family. Enjoy!